Are you afraid wearing eyeliner will make you look like a hung-over raccoon? If so, you might be missing out on a simple way to open up your eyes and give yourself a brighter, more youthful appearance. Forget your fear of eyeliner, and follow these simple steps to give your eyes a polished, clean look. The makeup counter can be overwhelming. We get it. From pencils to gels, and smudge sticks to liquid liners, the options are staggering. 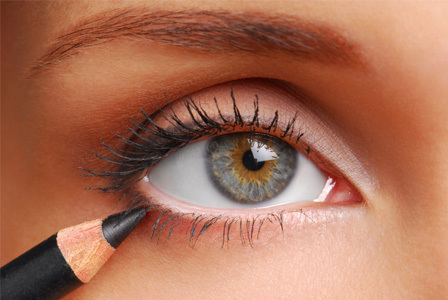 If you’re new to eyeliner, or lack confidence in your eyeliner application skills, start by using a mineral eyeshadow applied with an eyeliner brush. This method will give you maximum control, and you won’t have to worry about liquid eyeliner drying immediately, without giving you the opportunity to touch up your mistakes. Not sure whether to choose your eyeliner color based on your eye color, your outfit or your mood? Start by coordinating your eyeliner with your eye color. Blue eyes: A contrasting dark brown or black shade of eyeliner will bring out the bright color of blue eyes. Green eyes: Violet and green colors will enhance the emerald hue in green eyes, while dark brown eyeliner will add definition. Hazel eyes: Take a close look at your eyes, and choose the color you’d like to bring out. If you have flecks of green or brown, choose a mineral shadow in a coordinating shade. Brown eyes: The good news for brown-eyed girls is that just about any color eyeliner will work with your eye color. Use a small amount of water to dampen your brush. Load your brush with eyeshadow, and test color and thickness on the back of your hand. With your left hand (if you’re right-handed), pull the skin of your lid taut from the outside edge. Rest the palm of your right hand on your face to steady the hand that will be applying the liner. Starting at the outer edge of your upper lid, press the flat angled edge of your brush into your lashes as close to the edge of your lid as possible. Think of this process as making a series of dashes across your lid, which will be blended later. Press your loaded eyeliner brush into the lower lid, and starting in the corner first, work your way toward the center of your lower lid, pressing short “dashes” with the edge of your brush as you go. Holding your lid taut with your left hand, blend your eyeliner with a finger or a cotton swab. Remember, it takes patience and practice to master the skill of eyeliner application. Once you’ve gotten the hang of it, you’ll see what a difference a defined lid makes in your overall appearance.